Luang Poo Doo or Phra Phrompanyothera was most renowned among meditation practitioners in Thailand because of the amulets that he made and supplied to his disciples for holding during meditation. There is a controversy surrounding these amulets. It involves crystallized calcium (Pratard or dharma Tard)of different shapes that emerges on the surface of the amulets after they have been used in meditation for a period of time. There are two sides to this controversy. On the one hand, his disciples claim that what account for this phenomenon are sacred act of consecration which Luang Poo made and with which he blessed these amulets during their making. At the time , Luang Poo's mind is believed to be in the purest and holiest state that have the effect of purifying the calcium element in the amulets, turning them into crystals(Pra-Dhamma-Tard). The other side to this controversy, however, claims that the crystals are results those special materials intentionally added into these amulets during their making. These materials, according to them, were added to enhance the faith of meditation practitioners, thus helping them to better concentrate. As a meditation practitioner and amulet collector I have tried to get to the truth of this controversy and after a long inquiry, a conclusion is reached that the crystallized calcium (Pra-Dhamma-Tard)found on the surface of Luang Poo's amulets actually emerges by itself, rather than artificially inserted. One reason in support of this conclusion is that Luang Poo always relied on his disciples in the making of these amulets, particular in the filling-up process, so that if there was any intentional addition of foreign materials, there must have been a large number of witnesses to this. In addition to this, I and my meditation-practicing companion have visited Phra Ajarn Varongkot Viriyatharo, one of Luang Poo Doo's disciples, at his cave temple. Phra Ajarn Varongkot not only witnessed the making of these amulets himself while Luang Poo was still alive, but also has inherited the whole technique from him. My companion was so very impressed in Buddhist meditation that he decided to ordain as a monk and stay at the temple for two months. During this time, he occasionally saw and took part as a helper of Phra Ajarn Varongkol in producing (cement fill-up process) some amulets. At those special moments, he interceded with Luang Poo, asking for his permission to mentally dissect the filling up process in his meditation in order to get to the truth about the crystallized calcium(Pra-Dhamma-Tard). 3. it needs a special power derived from holy and earnest prayers made by individuals practitioners. When these three factors are present, the crystallized calcium (Pra Dhamma Tard )will emerge, but with different shapes depending on the constitution and manner in which each practitioner makes his prayer. This explains the fact that crystallized calcium(Pra Dhamma Tard) on Luang Poo's amulets cannot be forged. At worst, forgers can sprinkle on the amulets materials that look similar to such calcium and get the results that are far from looking genuine. 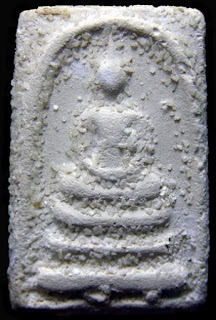 At best, they may obtain the first and the second factors, namely, Luang Poo Doo sacred powder (may get from Luang Poo Doo broken amulet) and moisture, yet have to do without the pure and holy mind in prayers which is of first and foremost importance for the emergence of the crystals(Pra Dhamma Tard). Finally, my companion also has taken an experiment in which he poured cement without Luang Poo Doo sacred powder into amulet moulds and put on moisture as in standard procedure. After getting the results, he then separated them from the lot so that they would not be consecrated apon by Phra Ajarn Varongkot as others. 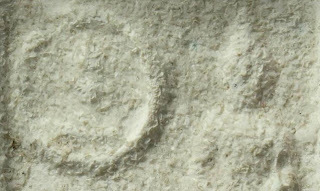 The hypothesis he was testing here was that if the crystallized calcium (Pra Dhamma Tard) is truly a result of a combination of cement and moisture, and not of secred powder and holiness of prayers, crystallized calcium (Pra Dhamma Tard) must appear on the surface of those amulets. Miraculously, none of calcium crystals (Pra Dhamma Tard) did appear on those amulets. This put the doubt to rest. My practicing companion now believes in the sacred and holy source of the crystals (Pra-Dhamma-Tard) found on Luang Poo Doo's amulets. Readers may have different opinions to which they are entitled. So this article should be seen as my inquiry into one of the most asked questions about Luang Poo Doo's amulets to find answers that can satisfy meditation-practicing companions and amulet collectors. Readers who have further questions with meditation or use of amulets to support meditation can consult the following website of Tham Muang Na Temple at http://watthummuangna.com/ or the thesis titled "Study of Amulets as a meditation strategy" which was written by Robthit Waisusri, a PhD graduate from Mahachulalongkornrajvidhayalai University, Thailand and also the writer's companion who took experiment mentioned in this article.